Artist and homing pigeons collaborate to capture magnetic attraction and homeward passage. Humans, like pigeons, may be drawn to a particular place throughout their lives via a form of deep magnetic attraction. In the work Remote Viewing, Lucy Bleach invites members of the Moonah Homing Pigeon Association1 to share their ‘sites of attraction’. The fanciers provide maps, GPS locations, verbal directions, and a small flock of pigeons. The members do not reveal why the site is significant to them, why they endure an ongoing pull towards it, as it is their own private magnetism. Sanctioned by each fancier, as an envoy between place and magnetic pull, the artist travels to each fancier’s location of attraction, accompanied by their birds. A spy camera secured in a purpose-built harness is attached to the breast of one pigeon. On release, the birds leave their fancier’s selected site and, by drawing on minute magnetic particles in their beaks, navigate their way home using the earth’s magnetic field, as the site and aerial journey home are recorded on the video camera. At the completion of all flights, the aerial footage is previewed in a one-off screening at the Moonah Pigeon clubhouse, (re)connecting the fanciers to their sites of enduring attraction. 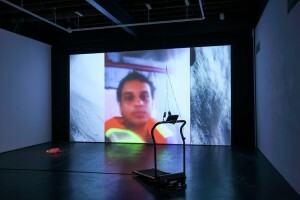 The footage then migrates to Melbourne to be screened as simultaneous individual flights, indexing journeys travelled and connections performed as persistent loops within the TRACES exhibition for Performing Mobilities. Remote Viewing, video still. Courtesy of the artist. I am in the air as I write this. Flying from Melbourne to Stockholm, I am now suspended some 35,000 feet over the Earth’s surface. Attached to the belly of this airplane there is a camera capturing images of the gliding globe below. I am able to observe the Earth’s spherical shape and its changing skin condition through a small TV screen attached to the seat in front of me. I am transfixed. Streaming into my field of vision, the steady image of the world strikes me as artificial in comparison to the choppy, jerky, even dizzying images of Remote Viewing. I look out, onto the wings of plane, they are not flapping. I look now to my own wings: the left holds the notebook that holds the words that that I now type into the computer, the right grips the pencil that flows evenly back and forth over the piece of paper. By attaching bra strap harnesses with tiny cameras to homing pigeons, Lucy Bleach affords us a peek at the magnificent journey of a group of birds, but what strikes me most about this creative register of a body mass moving through airspace is the directionality. The magneto-reception ability of pigeons is a proven fact. Still unresolved is whether the sense ability to perceive direction, altitude and location – by detecting the magnetic fields of the Earth – is achieved thanks to cryptochrome-mediated receptors in the eyes or if it depends on a beak magnetite. Either way, or actually both ways, is testament to the sweeping choreography of individual bodily function and earthly guiding forces. Being alive during the sliver of history in which the human desire to fly is finally a lived reality, makes me think back to the myths, attempts, and ultimately to all of the projecting that it has taken for the fashioning of a vehicle that allows me, now, to perform airborne mobility. In the midst of this fantastical, mortal feat, I notice that the performance of this utmost engineered mobility actually entails that my own individual body be buckled in. Though not fully motionless, freedom of bodily action is highly restricted. Seated, supervised, I am a consumer. Every so often, I stop writing to look at the screen that shows me the Earth I belong to, and I use this time to practice a blood circulation method I learned from a dear, old Korean woman. Her vitality had always been apparent to me when I mustered up the courage to interrupt her and ask what she was doing. Her reply was that I should mimic her actions: hold out your hands, palms facing each other, touch the fingertips of one hand to those of the opposing other, keep the palms hollowed out as if holding a large grapefruit. Proceed to rotate one thumb around the other, holding the pressure of all the other finger tips and the hollowed palm. Move through all ten fingers, rotating in both directions. This she said ‘will circulate the blood around the whole of your universe, avoid stagnation in the home’. An encounter between asylum-seeker artists and people in the societies they arrive in.